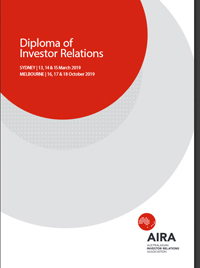 AIRA's Diploma of Investor Relations offers insights into some of the key issues in investor relations and provides valuable learning which participants can apply in their role. Day one has been specifically designed as a stand-alone course for those new or recently appointed to their first IR role. By the end of the day, participants will have the tools and techniques to run an annual IR program within the myriad of regulation and understand the needs of all stakeholders. Days two and three have been developed as an intensive course for experienced investor relations professionals or individuals who have completed day one as a stand-alone course. A combination of presentations and case studies will assist practitioners to explore recent developments and current IR issues. On completing all three days of the course, participants may undertake a one-hour online exam. On passing this exam individuals will be awarded with a Diploma of Investor Relations by the Australasian Investor Relations Association and may use DipInvRel post-nominals. Please note all registrations are subject to a $500 per day cancellation fee on receipt of course notes. Pricing is quoted inclusive of GST. To confirm you registration, please proceed to CHECKOUT by clicking on the button below. Please SIGN-IN below to register. Not sure if you have an account, click on FORGOT PASSWORD and enter your email address. If you have an account you will receive an email notification to reset your password. If you do not have an account, please click on CREATE A NEW ACCOUNT. PLEASE PROCEED TO CHECKOUT TO CONFIRM YOUR REGISTRATION.